This page lets you search the VPOP3 message archive. You can enter the data you want to search for in the boxes in the top portion of the screen - eg Sender email address, Subject, etc. Press Start New Search to start a new search. Note that if you search for message content, then that will take a long time, and cannot search messages which have been moved into ZIP files because VPOP3 has to access the archived messages themselves. The other search fields can be searched from an index database so will be a lot quicker. If you have to search message contents, then we recommend using other search criteria as well, such as date or sender, so that the number of messages VPOP3 has to search through for the content is reduced significantly. 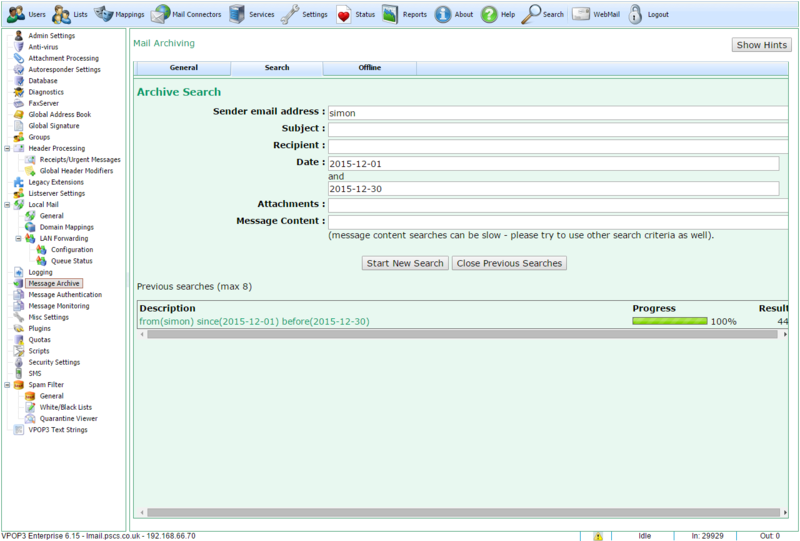 The search fields are all treated as substring searches, so in the screenshot above, VPOP3 will search for 'simon' in any part of the sender's email address. 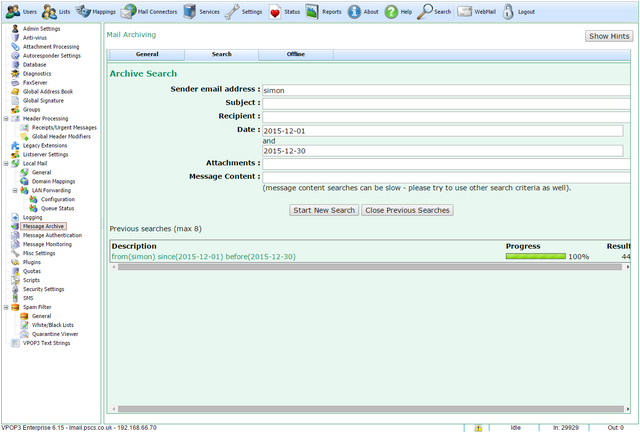 VPOP3 will find up to 1000 matching messages for each search. VPOP3 can perform multiple archive searches at once (up to 8 per session), and will keep track of up to 8 previous searches (8 active & previous searches in total). If you need to perform more searches, you can click Close Previous Searches to make VPOP3 forget previous searches. The searches will also be forgotten if you log out (or the session times out). When a search is completed the description can be clicked on to view the search results on the Results tab.